The examples marked with (Spy) provide the Spy Configuration. 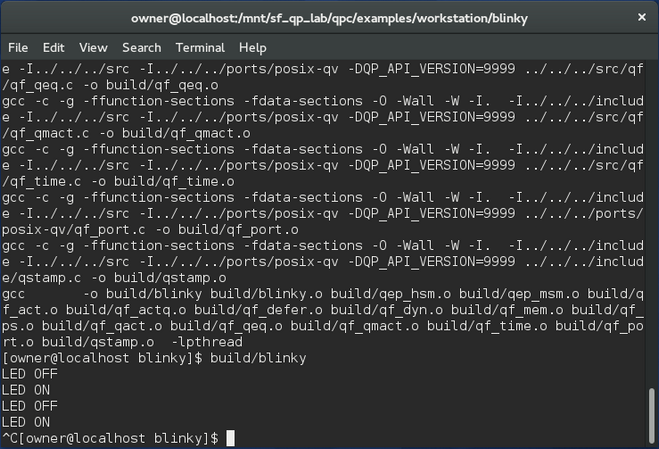 On Windows, the make utility and the GNU GCC toolchain (MinGW) are provided in the QTools collection, which is available for a separate download. The code can be also built with other tools as well, such as the Microsoft Visual Studio 2013 and newer. To reverse the selection, you need to move the comment # character. The single-threaded QP/C ports (win32-qv and posix-qv) are recommended for emulating software intended for deeply-embedded targets ("dual-targeting" the embedded software development). Examples in the workstation directory can also be used on the embedded versions of the desktop operating systems, such as Embedded Linux and Windows Embedded. For the embedded applications, the multi-threaded QP ports ( posix and win32, respectively) are recommended. 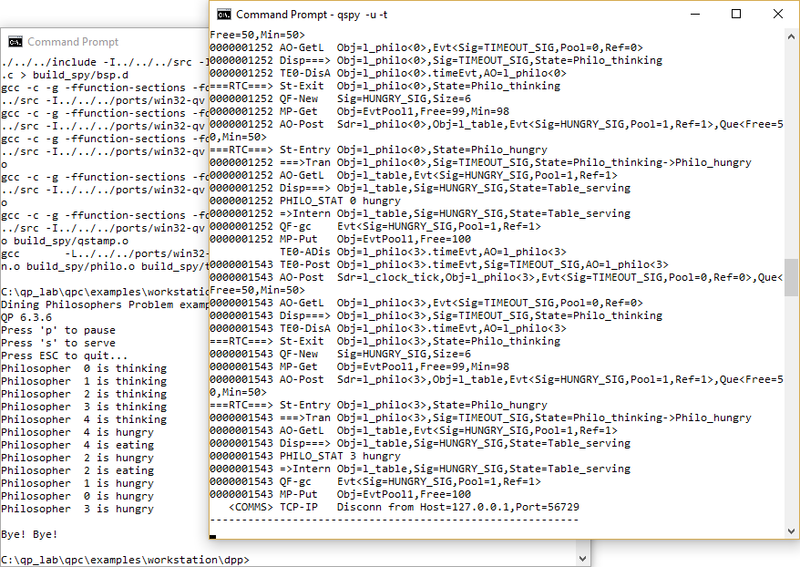 The Makefiles for the examples generally support the following three build configurations. The object files and the executable is located in the build sub-directory. The object files and the executable is located in the build_rel directory. The object files and the executable are located in the build_spy sub-directory. The Spy build configuration requires launching the QSPY host utility with the -t command-line option before running the example. This is so that the example code can output the QS software tracing to the TCP/IP socket of QSPY. Only specific examples support the Spy build configuration. The examples that don't support it, will report an error or will fail the linking stage.